After years of peaking at a friend or family member’s section of the screen on a first person shooter I finally find myself being rewarded for something I wasn’t “supposed to do.” In the N64 era of shooters, you had four squares and a golden gun. Now, in the 2016 era of shooters, you have a high speed internet connection and millions of friends and like minded gamers to play with. Today “screen lookers” have been made obsolete with the technological advancements in gaining and the availability of having your own console and monitor. Even if you go to your local LAN party most people bring their own gear, and we are seeing that a lot of the triple A high profile shooters are doing away with split screen and couch co-op. But if you thought split screen multiplayer was going away for ever you are in luck because Screencheat brings back the feeling of sharing the space with other players and with an interesting twist on gameplay rewards you for taking a little peek to see where the other players are. As a matter of fact “screen looking” is the key gameplay mechanic. Each player, whether it be a friend or a computer controlled bot, has their own little space on the screen. And the best part is they are invisible! That’s right, the only thing you can see is your gun. This makes it an absolute necessity to look at the other player’s screen. One would think that would be easy but I found it quite challenging to get used to. I remember a time where I would quickly and quietly glance at another player’s screen just to get a leg up on where they were at and racing to them to take them out only to turn around and deny that I ever did it. Now Screencheat forces you to rely solely on doing just that. Sharing the screen with up to 8 players makes for an interesting, but sometimes frustrating experience. The environment means everything in this game. Each level is broken down into sections consisting of a few colors. Long hallways, staircases, elevators, and moving platforms are all covered by their own bare and basic color palate. Each map has its own special obstacles, but none of them were truly special or really stood out. Sure I had my favorite (The Garden) but none of the levels will be remembered as iconic or a must play. There were not a lot of spawn points either, so more often than not I would respawn in an 8 man battle only to be thwarted almost instantly, but occasionally landing a double or triple kill with only being able to see the smoke seeping from an enemy’s freshly fired gun barrel was very satisfying. Being that this is a first person shooter the gunplay is what is most important and screencheat is a very boring shooter. The arsenal is unique and silly ranging from a small pistol, a candlestick, and a grenade launcher all the way to a wooden sword and horse that leaves a trail of fire behind you when charging your opponent. The shooting doesn’t feel good at all but in a way the game makes up for it with these corky weapons like a teddy bear bomb. All in all it remains a very fun shooting experience, just not a very good one. 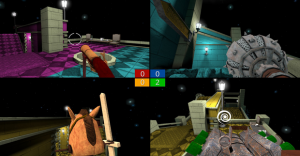 A fresh new take on the first person shooter genre coupled with a goofy arsenal makes Screencheat an overall fun game. 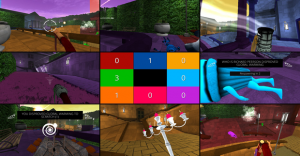 It offers traditional 4 player split screen fun, as well as the ability to add bots making it up to 8 players at once which keeps things pretty interesting. Although being invisible in a FPS is not my preferred method of play, I really enjoyed myself and welcomed the challenge. Online multiplayer, several familiar game modes, and a slew of timed trails leaves you with plenty of content to keep you satisfied all while expanding on the thrill of looking at another player’s screen.